ONLINE AND MOBILE SAFETY Noted entrepreneur and “Shark Tank” investor Robert Herjavec opens up about how we’ve defined cybersecurity, where we’ve left to improve and how the casual digital denizen can stay protected. What motivated you to enter the cybersecurity space in the first place? 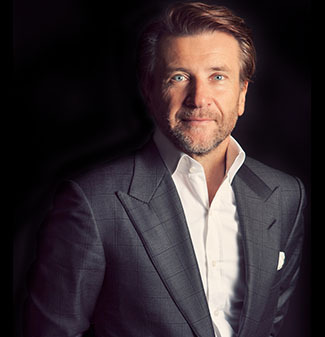 Robert Herjavec: I’ve been in this business for over 30 years. I entered the IT space because I was waiting tables and needed a better job. My friend was passing up the opportunity for an interview with a computer company and, when I learned how much it paid, I jumped at the chance to get in there and be interviewed. Once I started in the IT business my love for it grew almost immediately. I was blown away by how quickly things changed and by what technology was capable of. Think back to the tech of three decades ago: We’re talking the first ethernet connections. I remember the early days of Herjavec Group when our sales team’s first question on a cold call to a customer was, “Do you have an internet connection?” If yes, they’d ask more questions, if no they would say thank you and hang up. We don’t have that problem anymore. How has the industry changed since you first became involved? In 2003 we recognized that enterprise organizations needed to keep their data secure, but in some ways we were ahead of the curve in our offering of services. We offer consulting, delivery, managed services and remediation support to large-scale organizations with very complex environments. We really couldn’t have predicted how far our space would come in such a short period of time. If I look back 30 years—wow—entirely different. The internet, cellular phones, the proliferation of technology, Internet of Things. It’s all about interconnectivity today and the key word is “more”—more endpoints, more connections, more data, more threats, more risks. Today when you walk through Times Square in New York, the billboards can track you via your mobile phone and you’ll receive spot advertising customized for you. That’s incredible to me. Yes, today it’s digital marketing 101. But think of all the pieces of technology that have to integrate to make that possible. Also think of the risks; cybersecurity is mainstream today because we’ve seen the repercussions personally, professionally and financially from not keeping our corporate and customer data secure. Security isn’t an IT issue; it’s a board-level issue for organizations globally. To speak more broadly, it’s a global citizen issue. The wars of today and even tomorrow will continue to play out via cyber warfare. How does your team at the Herjavec Group continually evolve in order to stay ahead of hackers along with the threats they pose? One of the key ways we stay ahead is that we employ a team of ethical hackers on our consulting team. Their job is to leverage the latest hacking techniques in order to assess the security postures of our clients. We also partner with best of breed technology providers globally to ensure we’re bringing emerging technology to our customers. We have to learn from each other so it’s important we understand the latest technology, have the ability to architect and configure it and then can develop services to support it. That’s how we stay ahead of the curve and proactively defend our customers from the latest cyberattacks. What is an emerging trend or initiative within the cybersecurity industry that really excites you? What keeps you up at night? Proactive threat detection and investigation is becoming the norm. It’s no longer ok to just block and defend. The role of the Threat Hunter is becoming pivotal as we’re seeing the growing need to detect, investigate and analyze very sophisticated and persistent threats in large organizations. Organizations want to know where the threat originated, how they should respond and what can be done to contain the incident. More and more, our customers are seeking answers to the risks out there in the deep dark web and we need skilled professionals, Threat Hunters, to support that level of work. What keeps me up at night? I’d say paranoia. I firmly believe only the paranoid survive. Jamie Dimon, CEO of JP Morgan Chase, said it best. He doesn’t stay up at night worrying about the markets; he’s worried about a cyberattack. You should always be worried about what you don’t know and in my line of work, you’ve got to be paranoid. What’s a realistic goal for the industry to strive for this coming decade? What’s a stretch-goal we should be pushing for? I’d love to see our industry focus on educating the youth of today about cybersecurity risks and information security in general. We have a shortage of talent and training in this sector that needs to be resolved because the risks we are facing aren’t going to decrease over the next 5 to 10 years. We need the support of post-secondary institutions to help teach a new generation of students how this technology fundamentally works so we can have a greater talent pool to pull from. I’ve given so many speeches where I call out the 0.0 percent unemployment rate in security. It sounds insane given today’s economy, but it’s true. Cybersecurity professionals are highly sought after and we need to ensure we’re replenishing the talent and teaching the next generation.